Here's my recipe for primal chips or fries (depending on how you slice them.) This is based off of a recipe from 150 Things to Make with Roast Chicken by Tony Rosenfeld. If you're not "Primal to the core" you could add 1 teaspoon brown sugar to this mix. If you love "chips" this is the recipe for you! 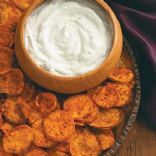 I adapted "Uncle Bill's Microwave Potato Chip" recipe to make sweet potato, white potato, tortilla, veggie, and fruit chips. But that's just the beginning! 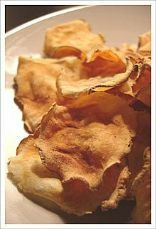 I'm still experimenting (and you can too) with other veggies and fruit to create "cheap, fast, easy, healthy fat free, kid friendly, fun to make" chips!